A fetching gray donkey sporting a striped red shirt stars in a pair of adventures by Harriet Ziefert, illus. by Emily Bolam. 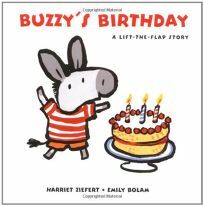 Buzzy's Birthday: A Lift-the-Flap Story shows the fellow helping his mother put up decorations and icing his cake, transforming his home into a party scene. Rhyming couplets see Buzzy through his nighttime preparations (bath, story, hug and kiss) in Buzzy's Big Bedtime Book. .